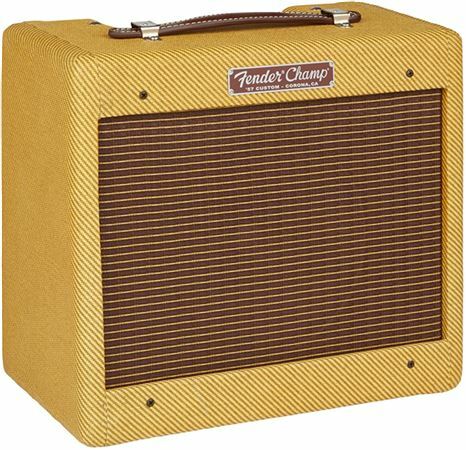 Shop Fender Custom '57 Champ Reissue Guitar Combo Amplifier from AMS with 0% Interest Payment Plans and Free Shipping. 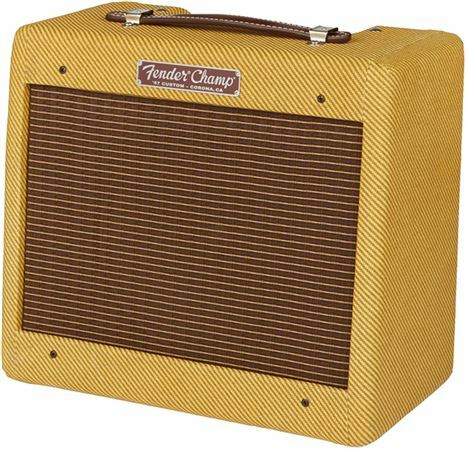 The Fender 5F1 circuit used in the ’57 Custom Champ has become legendary for its heightened dynamic response and sweet sounding tube overdrive when pushed. A 12AY7 preamp tube matched to a classic 6V6 power amp tube generates this in-demand overdrive. When the volume is cranked, this little wonder sings with the natural compression and rich even-order harmonics of a power tube working at peak output in Class A topology. The 8-inch 4-ohm Weber Special Design alnico speaker stays true to the classic Champ sound, compressing to create fat tone at higher levels while more than ably reproducing the raunchy tones found at the top of the amp’s volume knob. The hand-wired circuit includes newly sourced yellow coupling capacitors chosen for their authentically vintage Fender tone—sparkly cleans and creamy overdrive with smooth top end and round mids. 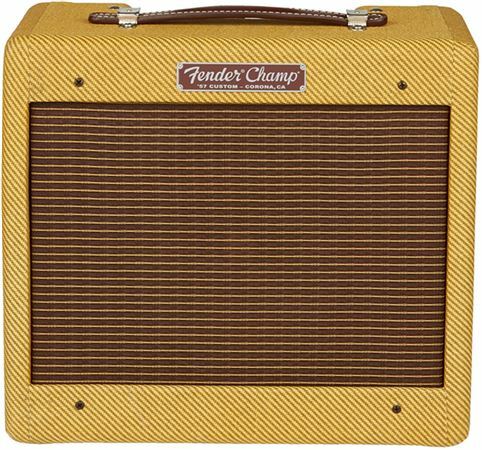 Of course this amp sounds great; it also retains classic Champ visual appeal—lacquered tweed, chickenhead knob, leather handle and 1/4-inch inputs for low or high output instruments are all here. In the studio, the 5-watt design means you’ll be able to explore the full range of available tones without overloading sensitive microphones (or your ears). Updated components, hand-wired craftsmanship and a classic circuit design all combine to create the ’57 Custom Champ, a style-spanning performer. Includes a protective cover. A must have for vintage tone chaser. I really believe fender hit this one out of the park. Just YouTube this amp, watch and travel back in time. I love this amp. The tones you can get from it are fantastic. From cleans to the perfect classic rock distortion with this thing cranked. Use this for the studio and it's perfect. It's quite loud for what it is but you would need to mic it if you are playing live with a full band. Great investment! It doesn’t get much better than this. This little hand built American made 5 W amp is a tone monster. Add about level 3 you get these bell like harmonics coming out of it . Kick it up past that and it starts to get really dirty and gritty. There’s not a pedal out there that can replicate the tones and punch that this amp has. It’s called the champ for a reason. This is just what's needed to keep neighbors at bay. There is no hum or buzz or rattle when it's on 12, and I got it plugged into a surge protector. Very tone sensitive using the controls on the guitar. Played it on 12 with a nu tubescreamer and the sonics were never experienced before, could feel and nearly see the wave variations. This is my second '57 Champ, they upped the quality control substantially. It was made July 2018, 3 months ago. I absolutely love this amp. At 5 watts it may be slightly loud for apartment or bedroom use if you’re looking for overdrive, but the amp takes overdrives incredibly well. The quality of the materials and craftsmanship are both excellent, and this amp will pay for itself several times over during its lifespan. It’s expen, but for me it was absolutely worth every penny. If you’re looking for a small amp that can provide rad overdrive at manageable volume and shines with overdrive pedals, check this amp out. PS: If you get this amp, I highly recommend replacing the 12AY7 with a 12AX7 if you’re looking for earlier breakup. Also, I replaced the stock tubes with some Tung-Sol’s and JJ’s and it seemed to really bring the amp to life. Best amp to come out of Fender since the early 60s. This is exactly what it says it is. A small hand built tone MONSTER. If you have never played an original 57 than this will be the best tweed you ever buy. Literally just turn it all the way up and discover what your guitars controls can do. It’s that simple and that fantastic. I absolutely love this amp!!!! This is an AWESOME amp!!! I am so glad I decided to get it. Thanks AMS! Beautiful little amp with a BIG, BIG sound! 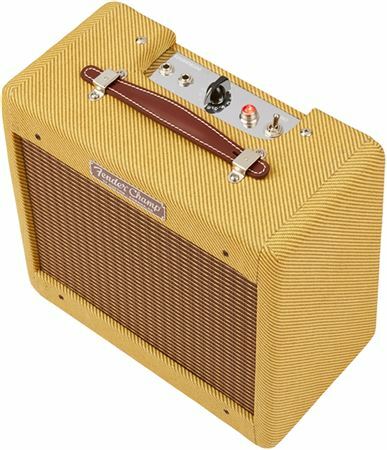 This is the first fender Custom Shop amp I have ever owned, and after this one.....yep....I will buy more! I have plugged in my Fender Eric Johnson Strat, my Fender '52 tele reissue and my Gibson SG S3 and they all sound PHENOMENAL with this little amp! I will say that if you decide to buy one, make sure to break-in the Weber speaker properly, because it takes a little time to have the cone and surround to work themselves in.....at first the speaker sounds a tad "grainy"...…..after break-in, everything smooths out. This is an amp that, in my experience, works great with the volume set all the way up, and controlled by the volume on your guitar...…. Buy one....if you like the sound of low-power Tweed amps......this is the one! Top quality, and everything one should expect given the price. Real nice vintage cover included. To be honest a week or more in of daily playing and I still haven't tried a pedal as there is no need. The amount of compression is what surprises me the most-really lets you dig in and around notes. Speaker is great-haven't tried a 12AX7 in it yet- again no need seen.